Before we explain, the procedure and requirements for copyright registration in Pakistan, it is essential to understand what a copyright actually is? Copyright is literally, the right to copy, though in legal terms “the right to control copying” is more accurate. Copyrights are exclusive statutory rights to exercise control over copying and other exploitation of the works for a specific period of time. Your exclusive packaging design or main page of your website may also be copyrightable in addition to trademark registration. Copyright initially only granted the exclusive right to copy a book, allowing anybody to use the book to, for example, make a translation, adaptation or public performance. At the time print on paper was the only format in which most text-based copyrighted works were distributed. Therefore, while the language of book contracts was typically very broad, the only exclusive rights that had any significant economic value were rights to distribute the work in print. The exclusive rights granted by copyright law to copyright owners have been gradually expanded over time and now uses of the work such as dramatization, translations, and derivative works such as adaptations and transformations, fall within the scope of copyright. Copyrights are a form of protection provided to the authors of “original works of authorship,” including literary, dramatic, musical, artistic, and certain other intellectual works. This protection is available to both published and unpublished works. What rights does a copyright owner earn after copyright registration in Pakistan? Negative right is to prevent anyone else from doing so without consent, with the possibility of legal remedies if they do. To reproduce the copyrighted work in copies or phonorecords. To prepare derivative works based upon the copyrighted work. To distribute copies or phonorecords of the copyrighted work to the public by sale or other transfer of ownership, or by rental, lease, or lending. To perform the copyrighted work publicly, in the case of literary, musical, dramatic, and choreographic works, pantomimes, and motion pictures and other audiovisual works. It is illegal for anyone to violate any of the rights provided by the copyrights law to the owner of copyrights. These rights, however, are not unlimited in scope, the copyrights law establishes limitations on these rights. In some cases, these limitations are specified exemptions from copyrights liability. One major limitation is of “fair use,” In other instances, the limitation takes the form of a “compulsory license” under which certain limited uses of copyrighted works are permitted upon payment of specified royalties and compliance with statutory conditions. For further information about the limitations of any of these rights, consult the copyrights law. How is copyrights enforced and what is anti-infringement mechanism? Copyrights are generally enforced by the holder in a civil law court, but there are also criminal infringement statutes. An unskippable anti-piracy film included on movie DVDs equates copyright infringement with theft. Copyright infringement, or copyright violation, is the unauthorized use of works covered by copyright law, in a way that violates one of the copyright owner’s exclusive rights, such as the right to reproduce or perform the copyrighted work, or to make derivative works. For electronic and audio-visual media, unauthorized reproduction and distribution are also commonly referred to as piracy. Copyrights protection subsists from the time the work is created in fixed form. The copyrights in the work of authorship immediately become the property of the author who created the work. Only the author or those deriving their rights through the author can rightfully claim copyrights. In the case of a work prepared by an employee within the scope of his or her employment; the employer and not the employee is considered to be the author if the parties expressly agree in a written instrument signed by them that the work shall be considered a work made for hire. The authors of a joint work are co-owners of the copyrights in the work unless there is an agreement to the contrary. Works that have not been fixed in a tangible form of Ideas, procedures, methods, systems, processes, concepts, principles, discoveries, or devices, as distinguished from a description, explanation, or illustration. Works consisting entirely of information that is common property and containing no original authorship (for example standard calendars, height and weight charts, tape measures and rulers, and lists or tables taken from public documents or other common sources). How long copyrights protection endures? A work that was created (fixed in tangible form for the first time) protected from the moment of its creation and is ordinarily given a term enduring for the author’s life plus an additional 50 years after the author’s death. In the case of “a joint work prepared by two or more authors who did not work for hire,” the term lasts for 50 years after the last surviving author’s death. For works made for hire, and for anonymous and pseudonymous works the duration of copyrights will be 50 years from publication. Is the transfer of copyrights possible? Any or all of the copyrights owner’s exclusive rights or any subdivision of those rights may be transferred, but the transfer of exclusive rights is not valid unless that transfer is in writing and signed by the owner of the rights conveyed or such owner’s duly authorized agent. What law regulates copyrights law in Pakistan? In Pakistan, copyright registration and ancillary regulation is employed by the Intellectual property office of government of Pakistan under the following statutes. 1. The author : This is either the person who actually created the work or if the work was made for hire, the employer or another person for whom the work was prepared. 2. The copyrights claimant : The copyrights claimant is defined in Copyrights regulations as either the author of the work or a person or organization that has obtained ownership of all the rights under the copyrights initially belonging to the author. This category includes a person or organization who has obtained by contract the right to claim legal title to the copyrights in an application for copyrights registration. 3. The owner of exclusive right(s) : Under the law, any of the exclusive rights that make up copyright and any subdivision of them can be transferred and owned separately, even though the transfer may be limited in time or place of effect. The term “copyrights owner” with respect to any one of the exclusive rights contained in copyright refers to the owner of that particular right. Any owner of an exclusive right may apply for registration of a claim in the work. 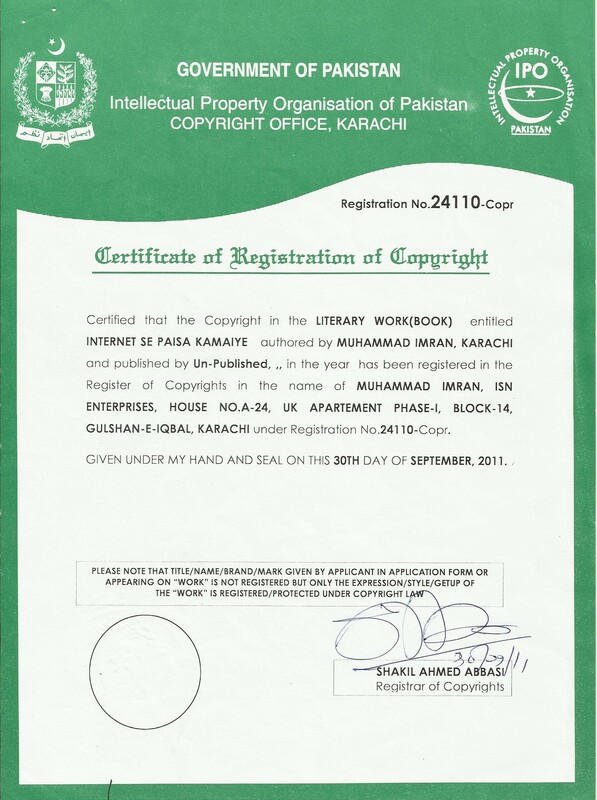 What is the copyright registration process in Pakistan? Copyrights Registration in Pakistan is regulated by the IPO Office. Registration helps establish prima facie evidence in court of the validity of the copyrights and of the facts stated in the certificate. If you have established a classic work of art and feel someone may steal it and/or damage your repute, then register the copyright this instance through our specialist attorneys and copyright lawyers, Blue Chip International will assist you in holding down those potential thieves to this invaluable intangible asset. The process for copyright registration takes around a year however we can assist by getting provisional approval letter within a month of application date.